You will need to set up the software to program your Arduino board. The Arduino Software (IDE) allows you to write programs and upload them to your board. 1. 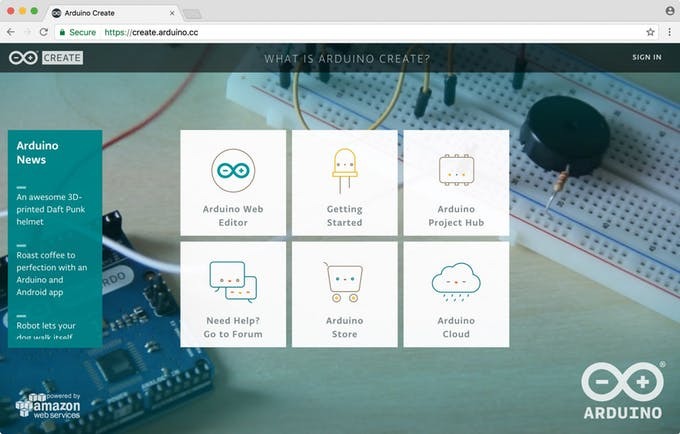 If you have a reliable Internet connection, you should use the Arduino Web Editor (online Arduino Software). It will allow you to save your sketches in the cloud, having them available from any device and backed up. You will always have the most up-to-date version of the IDE without the need to install updates or community generated libraries. To use the online IDE simply follow these instructions. Remember that boards work out-of-the-box on the Arduino Web Editor, no need to install anything. 2. If you would rather work offline, you should use the latest version of the desktop Arduino software (IDE). To download step-by-step instructions on how to install Arduino Software IDE in accordance with your operating system (Windows, Mac OS X, Linux, Portable IDE (Windows and Linux)) use the following link . When the Arduino Software (IDE) is properly installed you can choose your board from the list below to learn how to get started with it and how to use it on the Desktop IDE.